Wine Opinions is the leading provider of U.S. wine market research to wineries, wine marketing companies and wine trade associations around the globe, offering unparalleled trade and wine consumer insights and wine market intelligence. The wine market research capabilities and services of Wine Opinions include quantitative surveys of U.S. wine consumers and the wine trade; qualitative research including online and in-person focus groups and moderated wine tastings; baseline and tracking studies; and studies of consumer and trade trends and market data. Unique to Wine Opinions are its national proprietary panels of more than 4,700 members of the U.S. wine trade and over 20,000 U.S. wine consumers, primarily high-frequency wine drinkers and high-end wine purchasers. The oldest members of iGeneration will celebrate their 24th birthdays in 2019 and at Wine Opinions, we are beginning to track these youngest wine drinkers as a segment to compare to the youngest Millennials, ages 25 – 29. In her book, “iGen,” Jean M. Twenge Ph.D., a professor of social psychology, notes that they are the first generation to have spent their entire adolescence in the age of the smartphone, and that social media and texting have replaced other activities for them. How their social media and technology habits intersect with their wine shopping behaviors will be a subject of great interest to wine marketers. 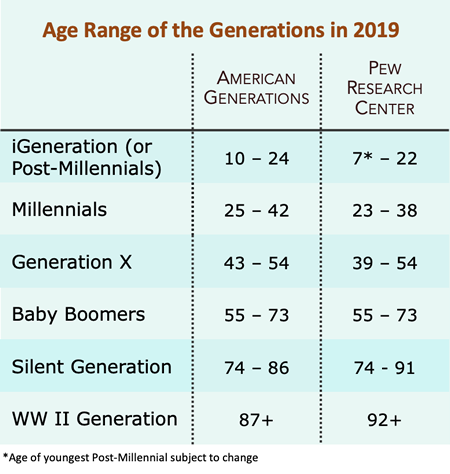 The chart on the right lays out the age ranges of the generations as defined by American Generations and the Pew Research Center. Wine Opinions uses the definitions set in the 8th edition of American Generations to analyze and report on these groups. You will find more thoughts on generations and how their names and age ranges are determined in our latest blog entry.